Limayre Mendoza had her 6-year-old daughter give her parents a Barbie doll dressed as a doctor to tell them she was accepted into medical school. 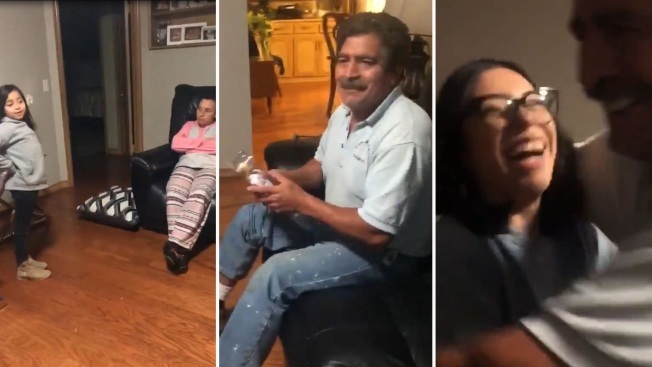 Limayre Mendoza captured the moment on video when her 6-year-old daughter Gabby gave her grandparents a Barbie doll dressed as a doctor to tell them she was accepted to medical school. Limayre's parents were jumping for joy. A young mother from Sylmar decided to tell her parents about her acceptance into medical school in the most heartwarming way. Limayre Mendoza captured the moment on video when her 6-year-old daughter Gabby handed her parents a Barbie doll dressed as a doctor. Her parents jumped for joy at the news. Mendoza posted the personal moment to Twitter, saying her medical school acceptance is a big step toward her plans to become a doctor. "I overcame the statistics when I graduated from college after having a baby at 17," Mendoza wrote. "Now my 6-year-old got to tell her abuelitos that mom is moving to Tulsa to become a doctor." Mendoza began her studies when her little one was only 1 month old. Although Mendoza and her family now live in Oklahoma, she is originally from Sylmar and considers herself "LA at heart." Her parents were born in Guatemala and arrived in California in the 1980s. While they lived in Los Angeles, her father worked in construction and her mother cleaned houses and became a nanny in Beverly Hills. The future doctor will move to Tulsa, Oklahoma where she will continue her studies, a career she began pursuing 6 years ago with her daughter by her side. Like Barbie, Mendoza is teaching her daughter women can be anything they want to become.